Always a pleasure to be part of our annual graduation ceremony in mid-December. For staff, it’s a really satisfying ritual to close out the year and RMIT definitely does it differently with its massive event at the Etihad Stadium in the Docklands (6,600 graduates and 27,000 family and friends attending). 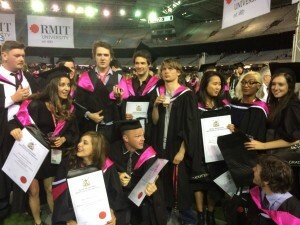 For graduates its a great moment to take stock and celebrate the hard work and achievements. All the best to the BComm Media graduates of 2014, some of whom are pictured below.